For instance, last night it was -40° F and yesterday, our high was -24° F. Hey, it keeps northern Minnesota under-populated … But I can’t lie; I’ll sure be glad when Saturday comes as the forecasted temperature is 30 above zero. This intense, prolonged cold makes homesteading hard at times. Monday night, our old doe goat, Shadow, died. Putting a coat on her and a bunch of extra bedding in the stall just wasn’t enough. We’re so sad. If I would have guessed, I would have brought her into the house, but she was fine earlier that night. The severe cold is hard on the heart. Here’s 17 pints of my latest canned refried beans. Meanwhile, it’s been homesteading like normal. I’m still canning up the #10 cans of refried beans I was given. As they are “vegetarian” refried beans, they don’t have much flavor. So besides adding enough water to make them soupy enough to can safely, I also added onion, garlic, and chile powder. Much better! Yesterday, I canned 17 pints and will do that again today. They’re so nice to have in the pantry for additions to quick Mexican meals. 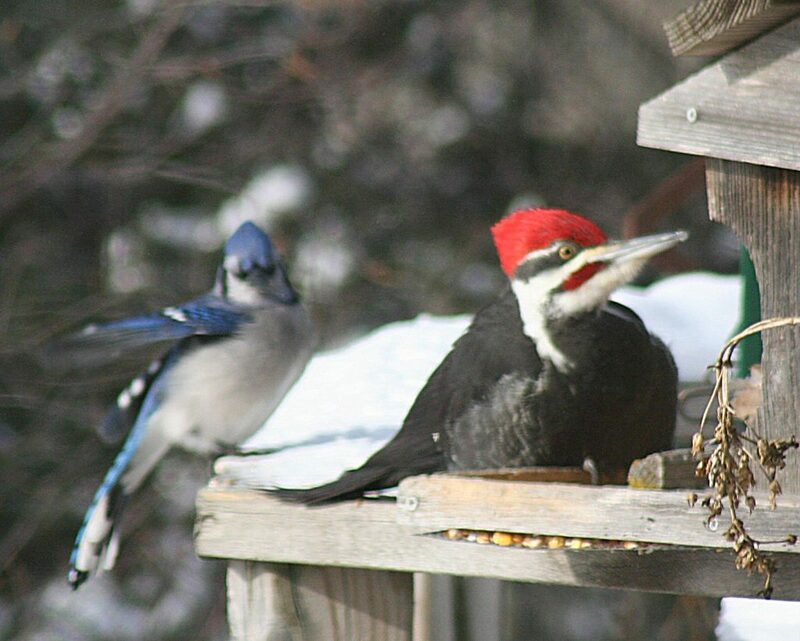 When the pileated woodpecker arrives, the blue jays back off and wait their turn. The big pileated woodpecker really brings color to the backyard when he shows up. i am canning black beans right now, following your recipe in ‘Growing and Canning Your Own Food” by Jackie Clay. Have used the hurry up method many times and thank you every time. Tired of the cold here too in eastern Montana but hasn’t been anything like your weather. Sorry about your beloved goat, the animals do become friends. Stay warm and thank you for doing what you do and sharing your knowledge. I am so sorry to hear about your Shadow. We as their caretakers feel much sadness when we loose one of our animals. We always second guess ourselves thinking about what we could of done differently. I find peace in knowing at the time, I did the best i could and look at it as another learning experience. We as homesteaders,live and learn, and gain much wisdom through our trials, no matter how big or small. Used to have a red headed woodpecker (don’t know what one, I am a bit south of you) that would hang upside down on the bird feeder and swing up to get some of the feed. It was probably a Red Headed Woodpecker. They are quite common but we’re a bit north in their range and I haven’t had one yet. So sorry to hear about your goat. That is hard to take. 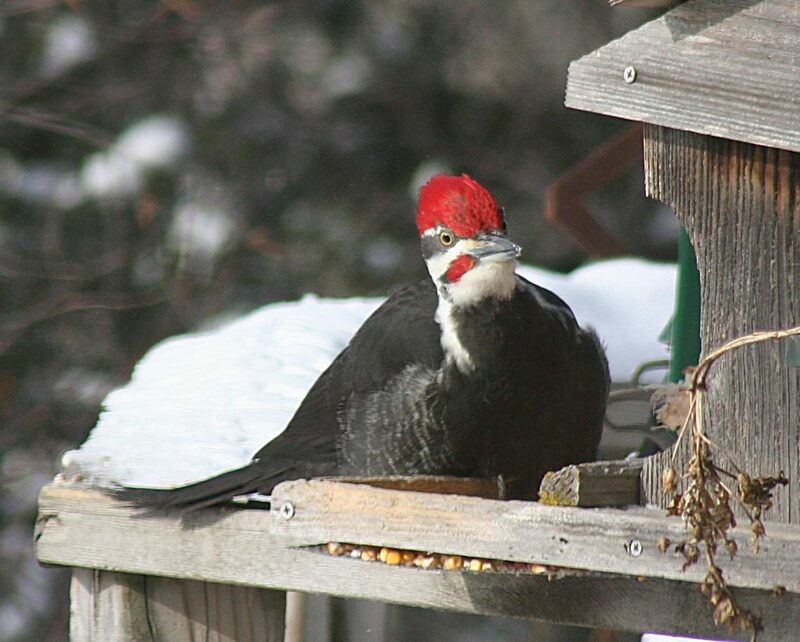 We too have a big pileated woodpecker who has been coming to feed. Just awesome. Have you ever seen the female? Wonder what she looks like. Love the idea about your refried beans! Anything home canned is great to have!! Yes, we’ve seen the female but she hasn’t come to the suet yet. She’s the same color but hasn’t the flashy red “mustache”, the red line up her cheek. I too am sorry about your goat, we had goats for years. About refried beans, my kids used to open a pint of pinto beans, pour them into a hot greased cast iron skillet and cook, mashing them down with a potato masher adding some chopped onion or onion pwd or any other ingredients they desired to make their own dip. I like to take a jar of canned pintos, put them in my small blender, add seasoning and a bit of water, then blend until smooth. I use this for my refried beans often .Just another idea. I really hope your cold weather ends soon. We have had a break but today the high’s only 9 degrees. But, hey, that’s better than a high of -28! Sorry to hear about Shadow. We also had the -40 temps and a high of -22 yesterday. Today it is -5 and it feels wonderful! Can relate to the cold and taking care of animals. In ’96 we had cows that we had to put in so that their udders wouldn’t freeze and then clean up after with a wheelbarrow and shovel all winter. It was a long one. Hope this winter is better for you from now on. Thank you, Amy. Our temps have moderated a bit so, as February is usually a bit milder, we have our hopes. But the beavers were sure right about this winter, weren’t they??? Our wind chills in the -20s and -30s have been humbling, just trying to imagine what your temperatures are like. Your step by step description of watering the animals was eye-opening as to just how complicated your days are. You do wonder how the wild animals make it when you know Shadow had good cover. I’m sorry about her. These temperature extremes keep you from being tempted to try to do outside work and having those canned goods lined up can brighten your day. Today I’m rendering lard and planning where to plant the seeds I got from you. The time to start seedlings is just around the corner, thank goodness. I hope the rest of the winter will be easier on you. I’m so sorry to hear about Shadow. We think we’re freezing here in TN–it’s about 20 above but supposed to get colder. Yall stay safe & as warm as you can–at least the canning helps keep it warm! Thank you Wanda. 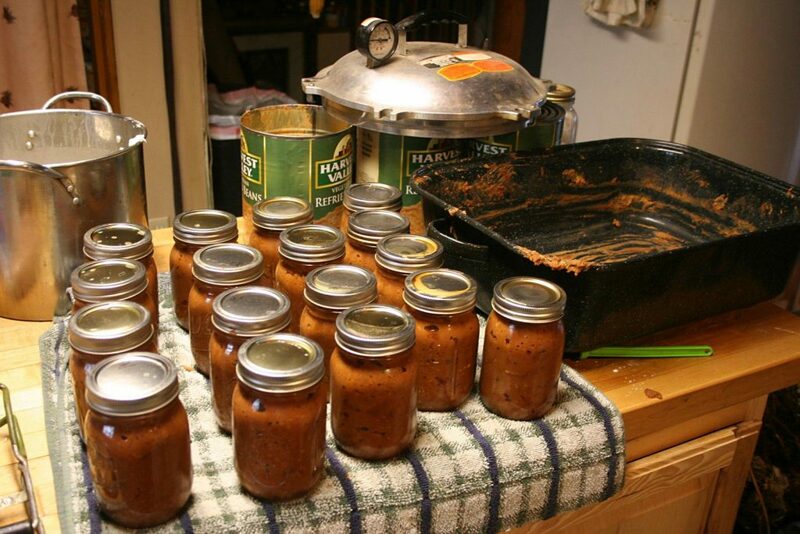 Yes, indeed, the canning helps keep us warm and busy too so we don’t get bored. Thanks for the info, Bernis! I feel bad I wasn’t going to be home when you drove home so we could have a visit. I always enjoy talking with you a lot! Maybe this spring??? Sorry about Shadow. As they say that weather is not fit for man nor beast. I think I will stay in the mountains in AZ. Cold and snow off and on but not as bad as you have it. Love the info on the refried beans. Yes, vegetarian ones do not taste as good. Great idea to add the extras. Sometimes I wonder how the tiny chickadees and nuthatches even survive when it gets so cold. But they do. And so do we. Those refried beans are really good, now that they’ve had some lard added and also spices. Pretty darned good! Goats are special. I bought your book when my 86 year old father bought four goats. Two were pregnant when he bought them. We consulted the book for kidding information. He mentioned the book on Sunday! Animals leave a special place in our hearts. Yes they certainly do. They are members of our family even though they live in the barn. So very sorry to read about the loss of Shadow. Sending big cyber hugs to you all and prayers for all the animals our in this bad weather. Thank you Diana! We really appreciate it. Wow! And I complain about -15 windchill! I’m glad to hear that you’re coping. Coping but not enjoying it. We breathed a sigh of relief when the temp climbed to 29 yesterday! Above! When you open a can of your “soupy” refried beans, how do you fix them? do you thicken them up with cheese or what? Also, do you have any mexican recipes to share with us, especially to use those soupy beans. I could use some ideas. Thanks so much for sharing you homestead knowledge. We wouldn’t miss reading your blog. Actually, those “soupy” when packed beans do thicken up quite a bit as they process. I just dump out a jar full, using a spoon to dig them out, and put them into a frying pan in which I’ve melted about 2 Tbs of lard. Then I use a potato masher to squash them down and let them fry and heat for about 10 minutes, turning them at least once. I often add canned, roasted chile peppers, chopped onion and garlic and, of course, cheese. You can vary this up by adding or leaving out ingredients. For instance, you can chop up some bacon and add that, vary the types of cheese, add more or less chile paste or peppers. I use them as dips, a side dish, to put in tacos along with fried, ground meat, spread them on fried corn tortillas, then add shredded chicken, pork or other meat, topping with cheese, then bake until the cheese is melted. I also use them as a casserole ingredient and make enchiladas with layers of fried corn tortillas, beans, shredded meat, tomatoes, onions and enchilada sauce. Of course, nothing adds flavor like cheese over all.